This stylish and compact wireless mouse, with a highquality finish and a smooth convenient scroll wheel, transmits using the proven advanced 2.4GHz standard. The ambidextrous and compact design is boosted by a ‘silent click’ feature, which gives you freedom without having to worry about disturbing those around you. All this, combined with the high-resolution 1000 DPI sensor, makes surfing and clicking a joy. The supplied Nano USB receiver can be stowed conveniently in the base of the mouse. What’s more, Rapoo’s power-saving technologies offer up to 12 months‘ battery life. Carefree wireless: The proven advanced 2.4GHz standard offers you a range of up to 10m and 360° coverage. Enjoy total control: The high-performance 1000 DPI optical sensor offers you smooth and accurate mouse-pointer control. Click all you want: The silent mouse switches allow you to use your mouse freely without disturbing others. 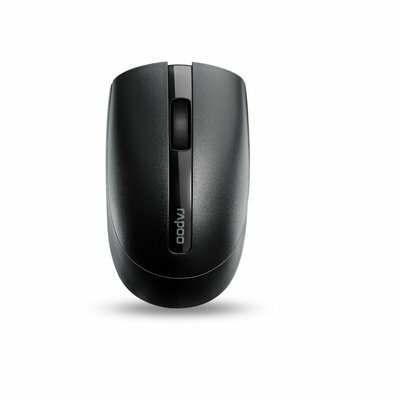 This mouse is perfect for late night projects at home, use at public places and while traveling. Low energy consumption: Rapoo’s energy-saving technologies, combined with the on/off switch, means you can use this mouse continuously for up to 12 months.